I'm sure you've seen this master in the new Lonny, but it was a smaller picture and I think it deserves to be front and center. So soothing, so pretty but cool too. I love the reading lamps. I love this room! I have to admit though, those reading lamps on the wall aren't working for me. They just stick out and not in a good way. Maybe it's the size? The shape? 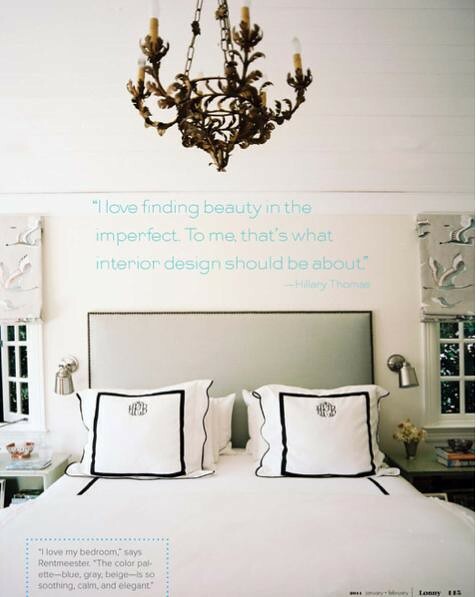 This room is great SO bright and cozy (: I also adore the quote and completely agree! haha... I met him through the TV screen ... but that would be super cool if I did meet him for real though ... maybe my blog post will cross his path!!! Can I have this picture brought to life at my house...love it! I totally agree, this room is a quiet winner in the jam packed Lonny issue. Usually adverse to bird type fabric, this seems perfectly in step. Your post had me take a second and look closer to some of the details I had missed!